My very first blog post was about a Brett IPA (turned pale ale) using Kohatua and Vic Secret. At the end of that post I mentioned brewing another Brett IPA using Nelson Sauvin and a different Brett strain (last time I used Amalgamation). So here we are. Last summer I was fortunate enough to attend the Allagash Street Fair in Portland, Maine. It was a great event with lots of delicious beer. I was surprised to find that my two favorite beer were from Austin Street Brewery. Simply because there was a solid line up of breweries pouring at the event. Allagash (of course), Bissell Brothers, New Belgium, Dogfish Head and more. But Austin’s Pale ale and Brett IPA (Brett Loves Hops) really stood out to me, the IPA especially. It was a little funky with tons of over ripe fruit and tropical flavors, and incredibly delicious. Anyone that knows me knows that Nelson is my favorite hop, it has such a unique aromatic and flavor profile. Stick your nose in a freshly opened bag of Nelson if you don’t believe me, it’s hop nirvana. If you haven’t tried brewing with it before it is described as having white wine, fruit, passion fruit and freshly crushed gooseberry characteristics. I’m sure I haven’t tried freshly crushed gooseberries to compare, but this is an amazing hop nonetheless. As with my Brett Pale Ale I stuck with a supportive grain bill for this beer. I want the Nelson and Brett to really stand out. Aside from 2 row I used wheat malt, and flaked oats for mouth feel and body. Carapils for head retention and acid malt for water chemistry adjustment purposes. I used polaris at 60 to make up approximately half the ibu’s, otherwise as the title states I used all Nelson Sauvin for the remainder of the hop bill. I save the entirety of those hops for hop steep, chiller, and dry hop additions, trying to pull as much flavor and aromatic punch as possible. My yeast selection was easy, Brett C WLP 645, as this is what’s listed on Austin Street’s description of their Brett Loves Hops. I’ve used it before with my Allagash Midnight Brett Clone and it worked well. I found it has a mild to moderate amount of Brett funk, but minimal leather and horse blanket character, hopefully resulting in a more pronounced hop profile. The one thing I have found with using Brett in primary is inconsistency in attenuation. When you use US05 often enough you know, within a couple of points, where its going to finish, depending on mash temp and pitching rate. But with Brett strains I haven’t found that consistency, at least not yet. I do love that they’ve been attenuating quite well so far, but I haven’t been able to reliably predict a FG. Maybe I just need more experience with these strains, only time will tell. Brew day went as expected. Brewed by my son and I, mashed in with 11L hitting target mash temp of 152F. Mashed out with 6L, and finally batch sparged with 2.5 gallons of 170F water. OG a few points high at 1.060, chilled to 60F and pitched Brett C. Fermentation well under way within 24 hours, primary seemed to wind down within three days. First dry hop addition added on day 12, left for 5 days. Racked to co2 purged keg with weighted bag of hops. FG 1.006. Left for two days at room temp, then put in fridge and started force carbing at 40 psi for two days, then reduced to serving pressure. Appearance: Pours very pale yellow (lighter than pictured), straw color with a light fluffy head that fades to a ring within a few minutes. Mostly clear. Aroma: Slight barnyard funk followed by typical Nelson aroma, grape, tropical notes, maybe a little pineapple. Taste: Good amount of Nelson character up front. To me Nelson is a complex hop, I always have a hard time describing the flavor, though it’s easy to pick out in any beer once you’ve tried it. Essentially the flavors carry over from the aroma, white wine, grape, light pineapple and citrus. Mid taste some mild barnyard funk followed by light bitterness that fades as the beer finishes dry. Mouthfeel: Medium carbonation with medium light mouth feel that finishes quite dry. Overall: I do enjoy this beer, it smells great, and it has a fair bit of Nelson character. But considering the heavy hop additions this is not as juicy and punchy as I would expect it to be. Certainly not nearly as good as Austin Street’s version, not that I expected it to be. But I do find myself wanting more, especially from such a punchy (and expensive) hop as Nelson. Lately I have been omitting a 10 minute addition of hops in favor of more added for the hop steep. I think for my next batch I’ll try the 10 minute addition again and see if that gets me more pronounced hop flavor. I would recommend Brett C as a primary strain and of course Nelson, if you haven’t brewed with it before, try it! Despite the cost it is worth it to use at least a couple of times a year. I would like to try brewing a double batch and fermenting the other half with a clean strain like US05, just to compare. But Nelson is just so expensive and it can be difficult to acquire at times, at least where I live. I doubt I’ll ever get the chance. I apologize for the poor quality of this picture. I was well into my brew day before I remembered I didn’t have my camera with me, and my phone had to do. Last July I finally made the move to kegging, my motivation to make that move because I wanted more life out of my hoppy beer. I was continually getting frustrated waiting for a bottle to condition, and by the time it did, the hops had faded considerably within two weeks. Not to say there’s anything wrong with bottling beer, and kegging certainly has its own issues. But I was ready to move away from bottling in the hopes kegging would give me some improvement with the life of my hop forward styles. Well, it did…eventually. The first beer I ever kegged was a single hop Saison with Nelson Sauvin. I never felt like I got the carbonation quite where I wanted it to be but I did enjoy the beer nonetheless. I knew I would come back to brew something similar some day, but as I always have a long list of ideas running (I’m sure most home brewers do) it got put on the back burner until now. I actually wasn’t looking to brew a hoppy Saison at the time. I was going through my hop inventory and I noticed I had quite a bit of equinox on hand. If you haven’t brewed with equinox I highly recommend it. It’s advertised to have citrus, tropical fruit, floral and herbal characteristics. Specific descriptors include lemon, lime, papaya, apple, and green pepper. That’s right, green pepper, which doesn’t sound like something you’d want in a hoppy beer but it’s subtle, unique and it works, somehow. Last summer I brewed a session IPA based on this recipe and it turned out well, but I didn’t want to brew the same thing again. I rarely brew the exact same beer twice, for better or worse. I had thought about a Belgian IPA, but matching a hop to an expressive yeast can be tricky depending on how it’s treated during fermentation. So I decided on my favorite Saison strain, Wyeast 3711 French Saison. It has some spice, and esters typical of a Saison strain, but they are fairly subtle. I think this makes 3711 work really well with hops that have citrus traits and it attenuates well. What’s not to love? The grain bill is pretty standard for the style, Pilsner malt making up the majority, wheat malt for mouth feel, and acid malt for water chemistry adjustment. Every time I brew with wheat malt I include a small amount of rice hulls to prevent a stuck sparge. Not that I think the addition of 11% wheat malt to the grain bill would have definitely lead to a stuck sparge, but I’d rather not have to worry or spend the time to deal with one. I had recently read about some home brewers adding their first charge of dry hops just as primary fermentation is completed. The reasons stated were that the yeast would have more interaction with the hop oils, producing more pronounced flavor and aroma. 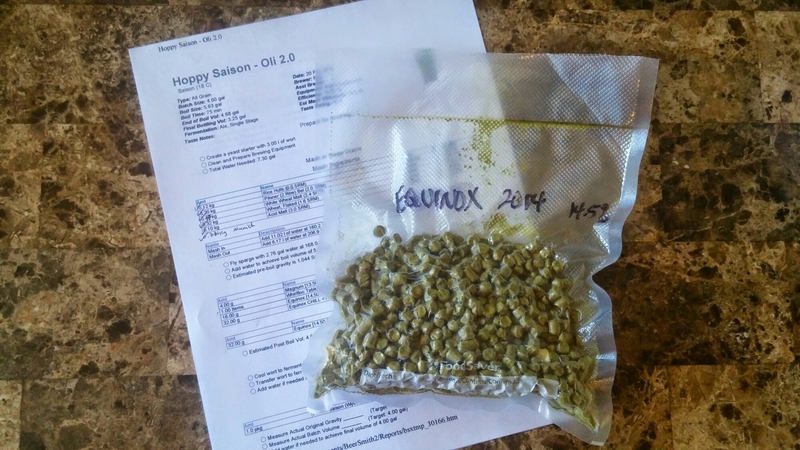 Even though I have finally settled on a dry hop method and schedule, I thought a single hop beer was a great chance to put this to the test,especially since I know what to expect from this particular variety. So my plan was to put aside a quarter of my dry hop allotment for this batch and add it approximately three to four days after pitching 3711. Brewed by my son and I. Mashed in with 11L reaching target temp of 149F, mashed out with 6L, and finally batch sparged with 2.8 gallons @170F. 75 minute boil. OG a point high at 1.059. Fermentation was vigorous within 18 hours of pitching. Within three days primary was winding down and first charge of dry hops were added. Second charge added one week later. Transferred to co2 purged keg four days later, last dry hops added to weighted bag in keg, SG all the way down to 1.003! I love this yeast strain, though this did bump my abv higher than I expected or planned. Appearance: Pours pale yellow (lighter than pictured) with a very slight orange hue, medium head that lasts for a few minutes before fading to a quarter finger. Aroma: Mainly fruit and citrusy hops, lime specifically. Shortly after kegging it was also slightly dank, but that dissipated within a couple of weeks. Taste: Initially a little dank but that faded as mentioned above. Citrus, lime again, with some fruity hops backed up with a small amount of spice. Mid taste I do get some alcohol notes, not heat necessarily but something a little off. Mouthfeel: Medium carbonation with medium light body that finishes dry, but not as dry as you’d expect for 1.003. Overall: I like this beer, anyone familiar with equinox would pick it out instantly. Unfortunately that possible alcohol flavor in the middle really took this beer down a notch or two for me. While the Equinox is quite present, I think I will go back to my previous dry hop method of half in primary at day 10, and half in keg. A week prior to brewing I had planned on doing this as a lower abv Saison, I’m not sure why I decided to brew this in the 6.5% range. This beer also finished 5 points lower than expected which pushed the ABV over 7%. I think I’ll re-brew this with my initial plan of a hoppy session Saison for the summer, likely with Equinox or maybe Azacca. I’m guessing that will be great for the hotter weather and help the hops shine through just a little more.